A stair cover must be used to seal attic stairs. Without a stair cover, there is nothing between you and the outdoors except the thin 1/8" piece of plywood! Energy Codes require these openings to be sealed and insulated - otherwise they are like an open skylight letting all your heat and AC just pour out of your house - wasting energy and costing you 24/7! Add our Reflective Insulation Kit to your stair cover. This slips over the stair cover and provides an insulating shield that reflects heat away. 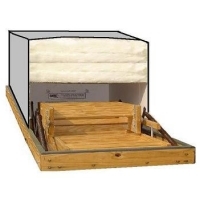 The kit provides a 16" deep air space between stair cover and shield to add your own insulation. The Reflective Aluminum Shield blocks up to 97% of radiant heat! Kit includes stair cover, reflective shield, and our R-50 "Ultimate" insulation kit. Easy to install. Assemble the stair cover and then bring the stair cover, reflective shield and R-50 insulation into the attic. Final assembly is performed in the attic as the finished kit will not fit through the stairs! How To Determine Correct Size To Fit Your Folding Stairs: Pull down cord - measure length and width of the hinged door (between trim). The attic stairway cover is self-locking - just fold it into shape. Self-locking tabs securely lock the ends of the cover into place. Test fit the Battic Door on the folding attic stairway frame. Then, apply the adhesive-backed weatherstripping to the top of the folding attic stairway frame. Position the Battic Door Attic Stair Cover onto the weatherstripping as you leave the attic. The weatherstripping is as wide as the attic door frame - just let it fall into place and the stair cover embeds itself into the weatherstripping. To maximize the benefits of the Battic Door Attic Stair Cover, if desired, the insulating value of the Battic Door Attic Stair Cover can be increased by adding insulation to the top of the cover.